From the original "boat" interior we only kept wooden ceiling and beams and gave the floors new coat of paint. 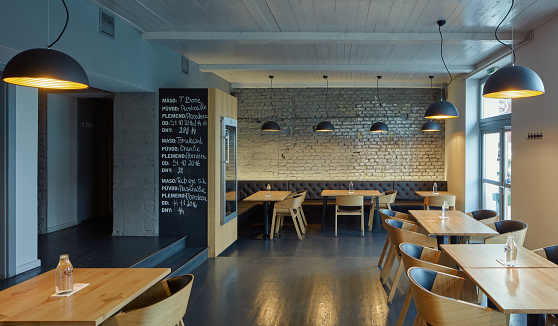 The oak furniture wooden elements stand out thanks to monochrome interior, including the gemstone of the restaurant - Dry Ager - where the meat matures. The only colour elements that lit up the whole area are gold insides of the pendant lamps. The front wall is decorated with original graphic by Jakub Šejvl that refers to the origins of steaks.